Pula is the largest city and port on the Istrian peninsula. The natural beauty of the surrounding countryside and the clear, blue waters of the Adriatic Sea have made it an internationally popular summer resort. Due to its size, exposed location, two accesses (from the sea and through Fazanski channel), low coastline and easy identification, bay has always had strategic importance. It has about 58,000 inhabitants, the seat of the governing bodies of the city and county. Developed a shipbuilding, textile and manufacturing industry, trade, transport and other cultural and educational center. The importance of town as a traffic intersection in the whole Istria has increased after the modernization of the airport. The old town itself is a monument built by the Romans in the streets of arachnoid, and today the streets in the historic core of follow the same directions. Tourism in Pula has experienced a boom during the 60's when the beautiful and developed the green coast south of town, the construction of modern tourist complex (gold rocks, Fisherman's Hut, Verudela). 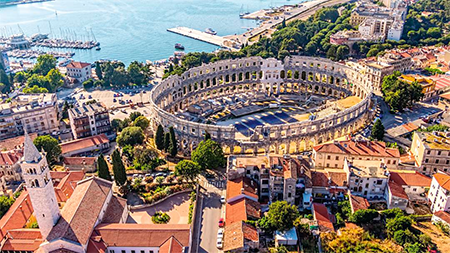 Today Pula offers many opportunities for tourists, because, with well-equipped Pula hotels, campsites (Camping Village Indije, Village Stoja Camp Site), and other types of accommodation facilities, tourist offer includes many sports grounds, recreation and entertainment, terraces, disco clubs, casinos, inns and restaurants, as well as diverse excursions. A favourite excursion point is the nearby Brijuni national park, the former residence of Josip Broz Tito. In the city there are two marinas and nautical tourism develops. It is also well known conference and a center of sports tourism, because of its mild climate, quality sports facilities (tennis courts, sports halls, football stadiums and playgrounds, athletic track, indoor and outdoor swimming pools, water sports, etc. ), and proximity to the Pula airport, come here domestic and foreign sports teams for winter training. Many tourist facilities are located outside of the city. Beaches stretch along 100km of the beautiful and indented coastline and guests can choose from a wide range of swimming spots. Just outside of the city centre, we recommend the swimming spots of Stoja, Verudela and Lungo Mare. Today the city lives in many colors and sounds, perfect contrast of exciting colorful past with modern times its present inhabitants and visitors. Boasts excellent preserved amphitheater, the largest amphora in the world, the Temple of Augustus, many churches, Venetian and Austro-Hungary architecture, rich in museums, galleries, concert events, great night life and many other attractions located in this famous city. The old town itself is a monument built by the Romans in the streets of arachnoid, and today the streets in the historic core of follow the same directions. It is certainly worth visiting the amphitheatre. The amphitheater was built in the 1st century, originally intended for gladiatorial combat, the most prominent monument is a symbol of the city. Is the sixth largest preserved amphitheater in the world and make it a battleground, an auditorium that could hold 25,000 spectators. Many events take place in amphitheatre (Arena) during the summer months and guarantee a fun and exciting holiday.